I’ve been forming this for a couple of months now, jotting it down piece by piece on scraps of paper, in my journal, in emails to friends. Little reminders for when I forgot or lost my way. Those tiny moments I couldn’t find the faith for myself or my dreams, or I didn’t know where to head on my path. I wanted to write this for myself, for what I needed to hear from myself. And now I want to share it with you, for all the artists, writers, photographers, mamas, healers creators, spiritual dreamers, poets, musicians & magic-makers who might need some affirmation, some praise, some loving words. We all go to that place of fear. What’s important is finding the feet & the path to travel to the next place. 1. Let’s play a little game I like to call Poignant Perspective. Inside you, there is a whole world of brilliance and beauty. Imagine the incredible inner terrain that is you: the great oceans of love, the mountains of achievements small and massive already made, the fields of wildflowers singing your name, the rose gardens dedicated to you in your honour. This whole big amazing world inside you. Try not to focus all of your attention on the little overgrow lot that needs some tending to. Remember, there is a whole world of rainbow beauty inside you. 2. Write yourself an ancient love letter. Imagine you have long, silky grey hair, whispy, in a braid. In your eyes, there sparkles a kind of wisdom, joy and compassion that can only be found after eighty years on this dear planet. Imagine this precious part of your self, remembering you as you were, smiling gently, sending you love back across the distance. Let this graceful, gorgeous Grand-Mother guide your hand, and write you a letter of all the things you need to know & remember. Dearheart, you were born on one special moment, one incredible day, one amazing year. Nobody knows the breaths you have taken, all the steps of your journey you have taken since the first. Yes, you are the rarest mosaic of all – a rich & incandescent tapestry enwoven with all the love, lessons & life only you can know & share. Rare tapestries are not meant to be compared in a flea-market-of-the-soul dearheart, and neither are you. Baby, it’s got a big & beautiful plan for you so majestic & wide that you can’t even dream it right now. Trust. All will be well. You are loved. All will be well. Expand. E x p a n d . E x p a n d.
Expand your vision of what is possible. What is not true for you, is true for others, and it can be yours if you want it. Sit in silence, and feel the parameters of your brain. Take a deep breath in, and widen the space your mind inhabits. Widen and expand until you know that what you desire is absolutely, unequivocally possible. Inhabit a new world of Possibility. Use the moment of blah, of blankness, of silence to check-in with your creative dream. Is it exactly what you want? Is your current dream the truest expression of your gifts? 7. Whose thoughts are the most important? Are you waiting for the outside world to approve of you or your dream? Does it matter more what others think of you & your dreams, or is it you? Do a business plan – but not just a business plan. A plan for your greatest soul’s desire. A map towards your truest heart’s expression & your dream lifestyle. Plan it. Put it out there in the universe. And find out the path forward, seeing the trail on your newly defined map. Hold your dog/cat/bird/animal/mama earth. Let them love you, and remind you of every single way you are perfect. Don’t take this list for gospel. Right your own. Your own divine, wise, brave wisdom is the Gospel for your life. Inside you is an incredible Goddess, waiting to help you along your way. What does she want to say to you? All the answers you need are already inside. 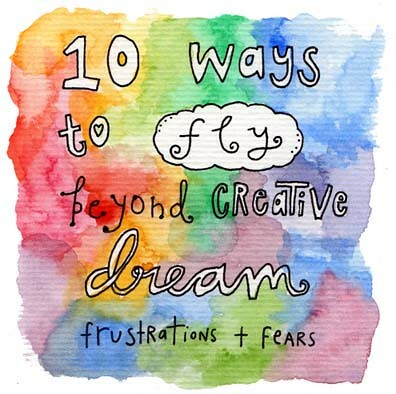 Write your very own list of Creative Dream Flight. You are the best expert on you. You are a Goddess. What do you want to say to the world?